EC1 is hard to pin down. I have always thought of the EC postcodes as being the City but EC1 is a bit different as it is not full of offices. 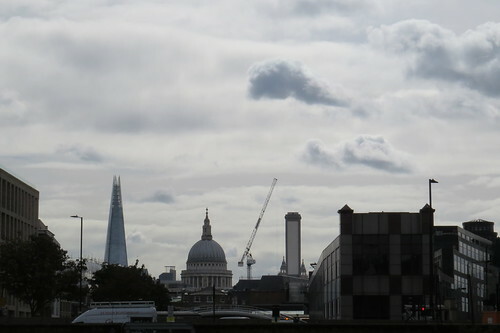 There is so much here but I am going to focus on the area around Clerkenwell. 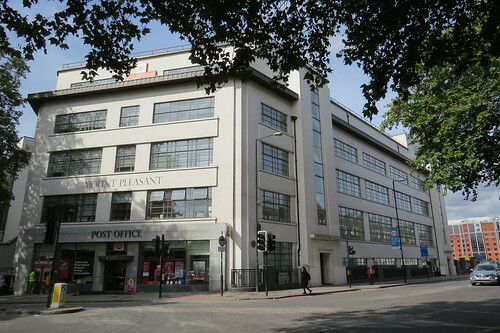 We start at Mount Pleasant Post Office which is where Rosebery Avenue crosses Farringdon Road. Our first stop is just over the junction from the Post Office. And the shops along the street are a mix of restaurants, cafes and “trendy” type stores, with just a few survivors of an earlier age. 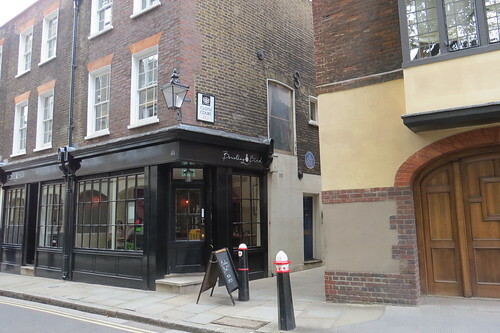 On the left though at Number 56, look out for the blue plaque. 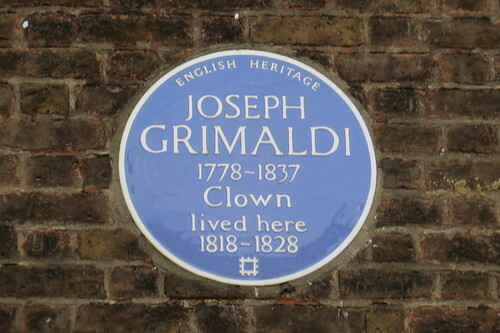 This is for the renown clown Joseph Grimaldi who lived here between 1818 and 1828. Joseph Grimaldi (1778 – 1837) was an English entertainer who developed the role of Clown which appeared in the harlequinade that formed part of British pantomimes. His harlequinade role of Clown became known as “Joey”, and both this name and Grimaldi’s white face make-up were, and still are, used by other types of clowns. Apparently he also had some catchphrases such as “Here we are again!”, which continue to feature in modern pantomimes. 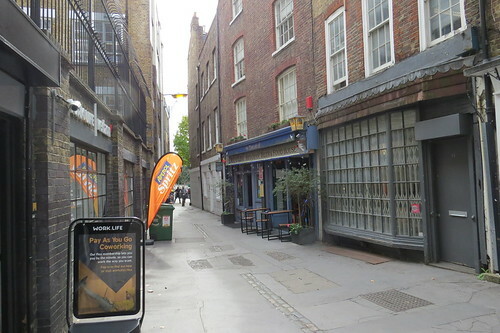 Now head back along Exmouth Market and you will see an alleyway to your left. 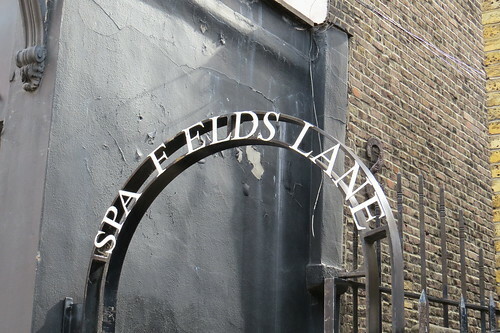 Go down this alleyway and you will find yourself in a little open space called Spa Fields, which is our next stop. Now head out of Spa Fields as if you had turned right from the way you came in. This leads you down a path and then to the left you will see our next stop. This was designed by Lubetkin in the late 1930s. It is almost impossible to get a good shot of this building, as you cannot get back far enough to take the picture full on and if you go to the side you cannot get all the building in. Here turn left and follow this road (which is Farringdon Lane) round. As you get to the railway bridge, there is a good view of St Paul’s flanked by the Shard on the left and what I believe is an incinerator chimney in Smithfield market in the right. Soon on the left you will get to our next stop. 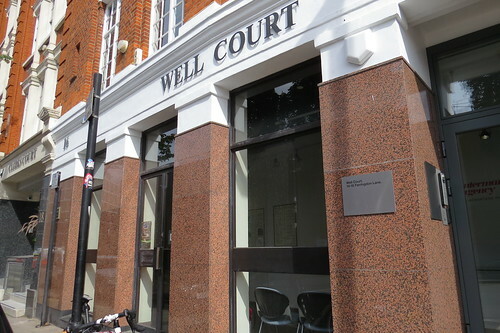 Continue along Farringdon Lane and stop at Number 16, also known as Well Court. But as a Clerkenwell and Islington guide I am able to access the key, should you ever want to visit! The well here is what gave the area its name. It lay just outside the boundary wall of one of the many medieval religious houses hereabouts – St Mary’s Nunnery. 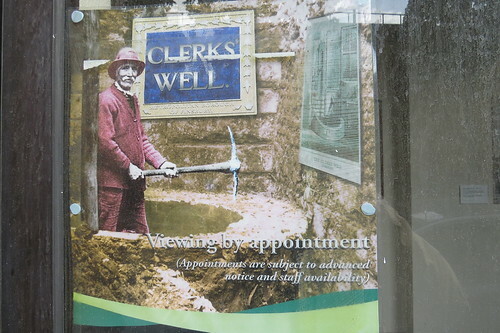 And the clerks we are talking about are clerks in holy orders, not office clerks. 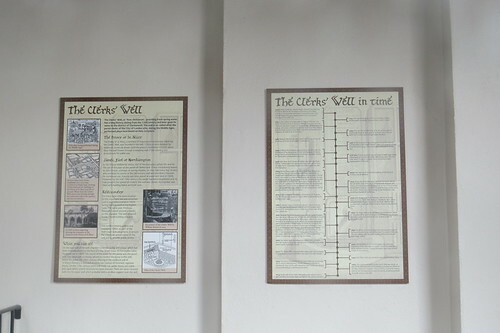 The well was only discovered in 1924 when rebuilding took place on the site. 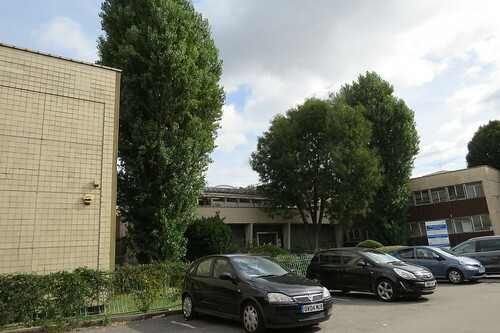 the building we see today dates from the 1980s. 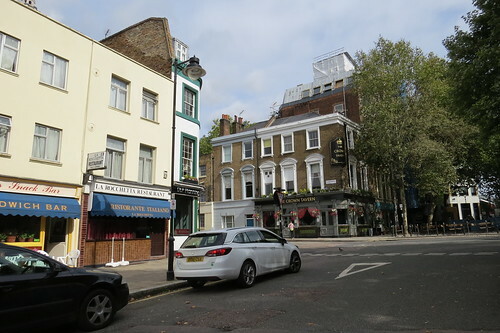 Now continue along Farringdon Lane and take the next left and almost immediately the road opens out into a little square which is called Clerkenwell Green. 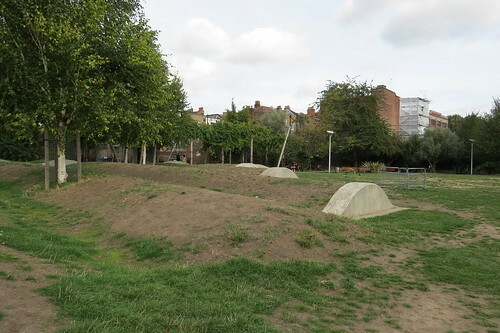 The thing to note about Clerkenwell Green is that there is no green of any kind here. It is entirely paved over. 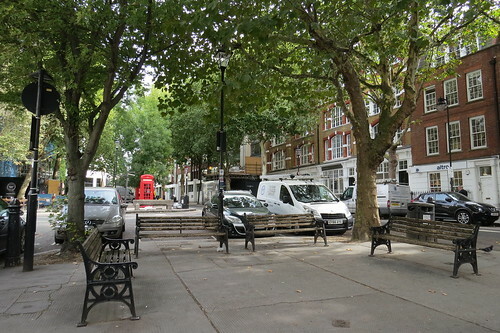 In Charles Dickens’s Oliver Twist (written in the late 1830s), Clerkenwell Green is where Fagin and the Artful Dodger get Oliver involved in pickpocketing amongst shoppers in the market which was held here. 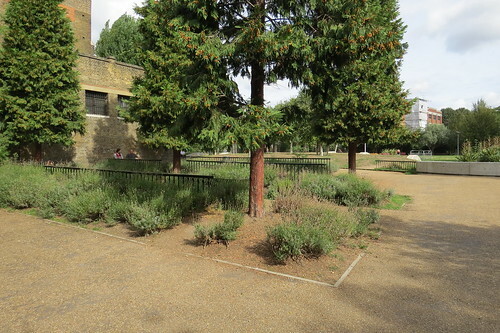 In Chapter 10, Dickens writes about “an open square in Clerkenwell, which is yet called, by some perversion of terms the Green”, despite lacking any “greenery”. So there was not even a green back then. There are a couple of interesting buildings here to your left, the Marx Memorial Library which holds more than 43,000 books, pamphlets and newspapers on Marxism, Scientific Socialism and working class history. The Marx Memorial Library occupied part of the building in 1933, eventually taking over the whole. 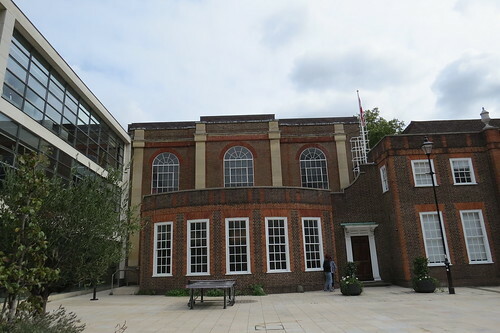 The building was substantially rebuilt in the late 1960s to restore its 18th century appearance. Interesting that it is called the Marx Memorial Library when it was Lenin who worked here. And if you look back there is the Sessions House. 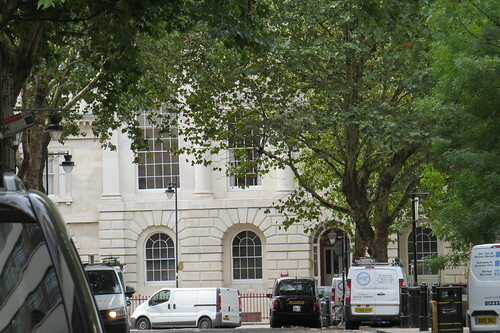 This was originally a Court House built in the late 18th century. From 1931 to 1973 it was the headquarters of Avery Weighing Machines. After a period of being empty it was acquired in 1978 by a masonic trust and the following year opened as the London Masonic Centre. In the last couple of years it has been sold and renovated. It is being marketed as a retail and restaurant destination. Take the road to the right of the Crown. This is Aylesbury Street. soon on the right you will an alleyway with a green plaque at the corner. 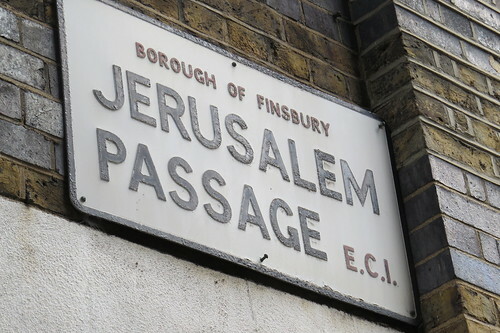 The alleyway is called Jerusalem Passage. It is a delightful little survival and is a reminder of this area’s religious connections. We soon get to an open square. To your left is the church of St John. It is more interesting than it looks. This was the church of St John’s Priory. Beneath is a 12th century crypt. After the dissolution of the monasteries in the 16th century, this became a parish church and was substantially rebuilt in the 18th century. In the interwar period with the decline of the local resident population, it was taken over by the Order of St John – more of which anon. It was badly damaged by bombing in World War II and had to be extensively rebuilt. How if you look ahead you will see across the main road, there is a stone archway. Go over there. This was a gateway to the St John’s Priory. To the left of the gateway is a non descript shop front. 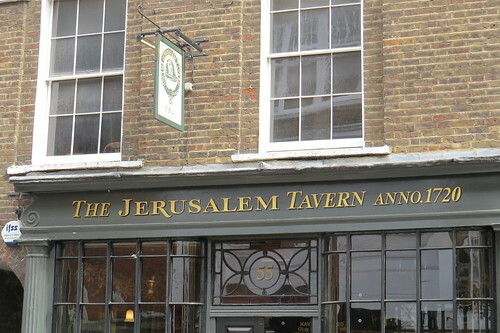 This was at one time a drinking establishment called the Jerusalem Tavern. 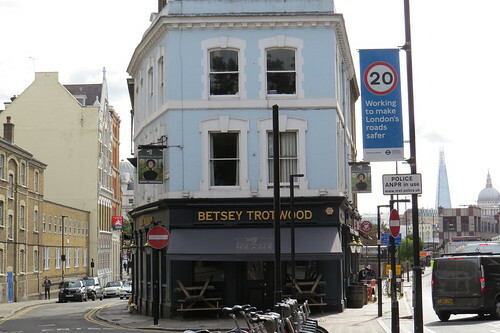 This name has been used for a number of tavern in this area. We shall see the current one shortly. 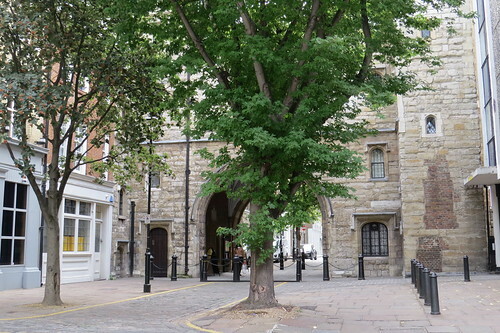 St John’s Gate is one of the few tangible remains of the St John’s Monastery. 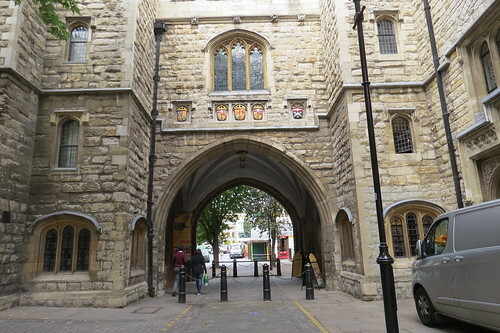 The gate was built in 1504 by Prior Thomas Docwra as the south entrance to the inner precinct of Clerkenwell Priory, the priory of the Knights of Saint John (known as the Knights Hospitaller). After centuries of decay and much rebuilding, very little of the stone facing is original. It was heavily restored in the 19th century when the Order of St John was revived and took over the Gateway, so this is in large part a Victorian recreation. 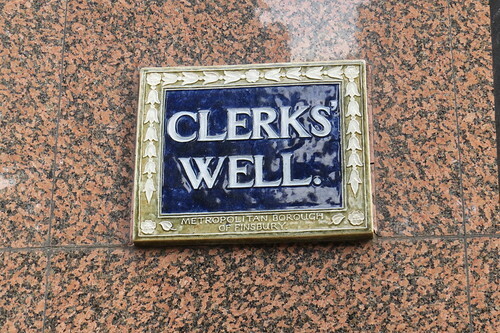 Now go back under the archway and turn left beside the Clerkenwell and Social drinking establishment. Keep going and you get to St John’s Path. Go along here and you will end up in Britton Street right by our next stop. The pub actually dates from the 1990s. 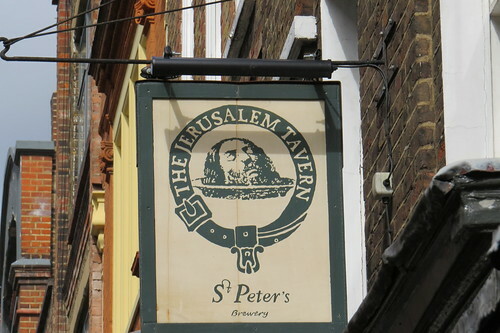 The building had been renovated to recreate a coffee house of the 18th century but was later taken over by the St Peter’s Brewery. That said it is a lovely space which sells great beer. It is well worth a visit. 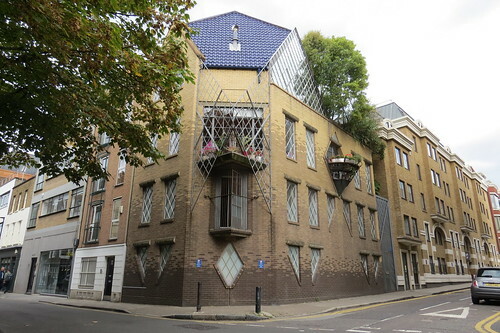 And across the road is an interesting building. This was built for Booth’s Gin. But again there is a bit of deceit here. This is just the facade of the Booth’s building and it was not originally in this location. It was round the corner in Turnmill Street. The building today is called Mountford House after the architect of the original building. 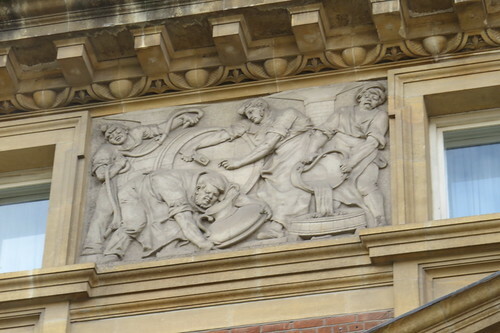 The facade has a series of reliefs which depict the making of gin. These were modelled by F W Pomeroy. He is perhaps best known for the statue of Justice atop the Old Bailey. This by the way was one of a number of gin distilleries in the area but today none of those historic names like Gordon’s and Nicholson’s make gin here. Now go as if you had turned left out of the passageway. Our next stop is just at the next street corner. 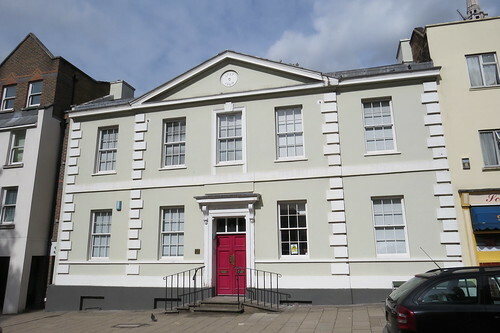 The building at Number 44 Britton Street looks intriguing and of course it has a story. this was built for the writer and broadcaster Janet Street-Porter. She commissioned this house in the 1980s when this area was a declining manufacturing district and hardly anyone chose to live here. How times have changed. 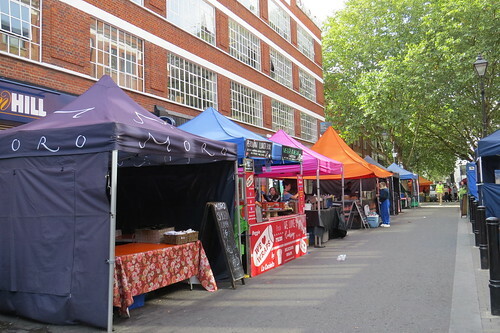 Now go down the side street by the little garden and this will lead you to the side of Farringdon station. 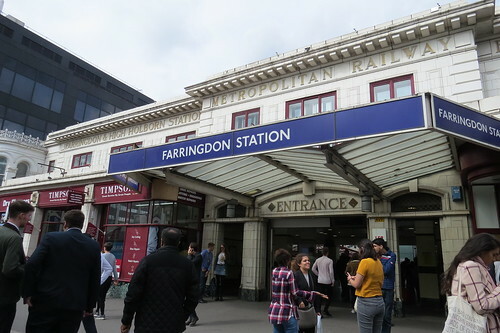 Farringdon station was the City terminus of the first Underground railway which opened in 1863 when it was called Farringdon Street. However there is really nothing left of this original station and the street facing station building we see today dates from the mid 1920s when it became known as Farringdon and High Holborn, which is a bit misleading to say the least. It got its present name in 1932. 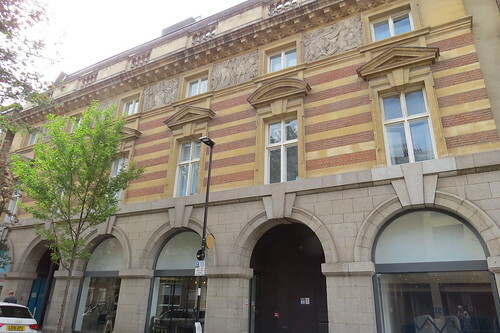 This building served not only the Metropolitan, Circle and Hammersmith and City lines but the so-called Metropolitan Widened Lines. This was a pair of tracks which parallelled the Metropolitan Railway from Kings Cross to Moorgate with a branch going south from here under Smithfield and towards Blackfriars. Today that latter route is used by Thameslink trains, whilst the line from here to Moorgate is disused, as it was not possible to keep the link when the platforms were lengthened here for 12 car trains. 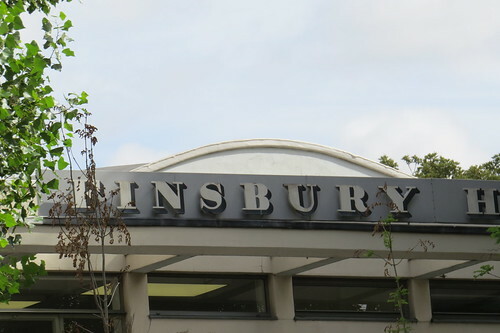 Across the road from the old station building is a new one which services as the main entrance for the Thameslink services and will in due course give access to the new Crossrail (Elizabeth line) station when it eventually opens. Now head up Cowcross Street away from the station and at the end you can hardly miss our next stop. n the Middle Ages, this was a broad grassy area known as the “Smooth Field”. It’s location just outside the City walls and it’s relative flatness meant it was an ideal place to drive animals and slaughter them here. And Smithfield established itself as London’s livestock market. In the 19th century, the slaughterhouses were moved to a purpose built facility at Copenhagen Fields, Islington, north of King’s Cross. For some 10 years the land here was left undeveloped until that is the City Corporation began to build a series of market halls to house the meat and poultry markets. The imposing Central market hall was designed by architect Sir Horace Jones, who was also responsible for Tower Bridge and Billingsgate and Leadenhall Markets. The design was inspired by Italian architecture and was completed in November 1868. As the Market was being built, a cut and cover railway tunnel was built to create a triangular junction with the railway between Blackfriars and Kings Cross. There were extensive railway sidings which enabled the transfer of animal carcasses to the Meat Market. These sidings closed in the 1960s and meat now comes and goes by road. The area is now used as a car park, accessed via a curved sloping roadway. 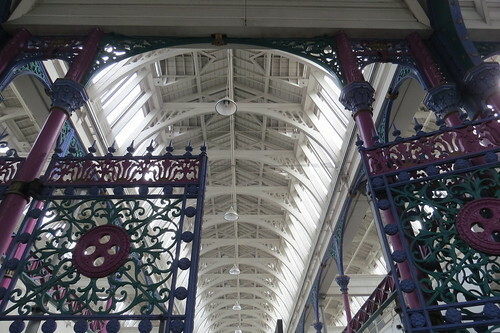 Smithfield meat market was extended between 1873 and 1876 with the construction of the Poultry Market immediately west of the Central Market, again designed by Sir Horace Jones. Then a General Market (for the sale of fruit and vegetables) was added between 1879 and 1883 with two more structures (the Fish Market and the Red House) built between 1886 and 1899. The Red House was built for the London Central Markets Cold Storage Co. Ltd and was one of the first cold stores to be built outside the London docks. 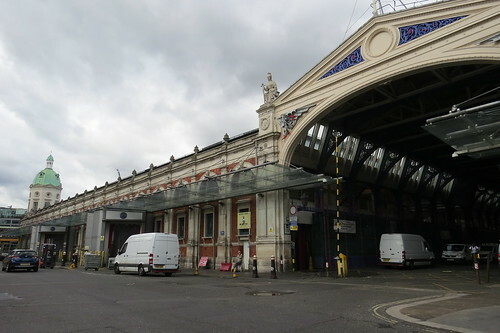 It continued to serve Smithfield Market until the mid-1970s. 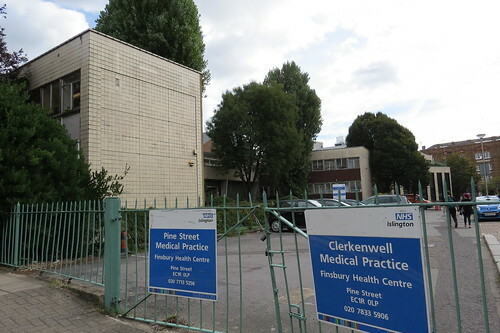 Some of the market buildings at the western end are now disused and there are proposals for the Museum of London to move into them, if the funding can be found. 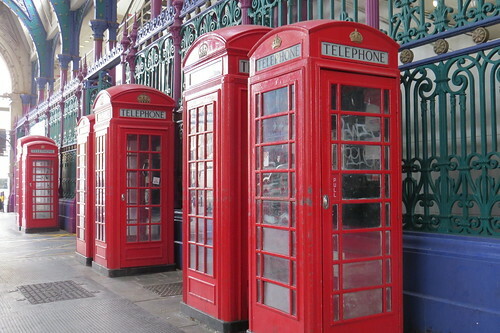 Inside the main cross passage of the Central Market is a great grouping of old telephone boxes. They are in pairs with the taller one being the original K2 box dating from the mid 1920s and the shorter one being the slightly later K6 dating from the mid 1930s. Now head through the Market building and out the other side. you will see ahead of you the rampway down to the car park on the right. There really is so much here I could cover. There is St Bartholomew the Great church, which is just a part of a great Priory church. It survived the dissolution of the monasteries by being reduced in size and becoming a parish church. But more interestingly it also survived the Great Fire of London, so is one of the oldest churches in London. St Bartholomew’s was a major hospital even back in the 16th century and King Henry VIII recognised this by re-establishing a hospital after the monks were kicked out And the Hospital is still here nearly 500 years later. Also nearby are various monuments to various people who were executed here – from William Wallace (1305) to Wat Tyler (1381) to an assortment of religious martyrs, burnt at the stake for heresy. 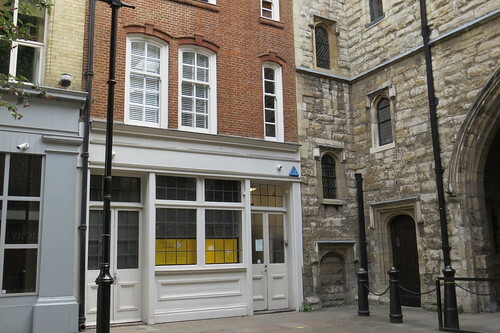 The name Cloth fair is a reminder of the long standing fair of St Bartholomew. A charter for the fair had been granted to Rahere by Henry I to fund the Priory of St Bartholomew; and from 1133 to 1855 it took place each year on 24 August. Originally chartered for trading cloth and other goods it became a pleasure fair as well. The fair was suppressed in 1855 by the City authorities for encouraging debauchery and public disorder. Now just along here is a little alleyway on the left. 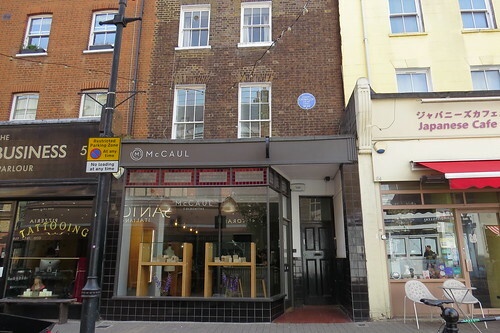 And lo and behold there is a blue plaque. 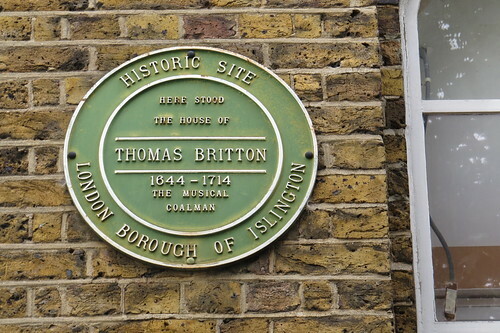 It does not look like a “proper” one as it does not say “Greater London Authority” or “English Heritage”. Burt nonetheless it does mark an interesting connection. John Betjeman (1906 -1984) was a poet, writer, and broadcaster. 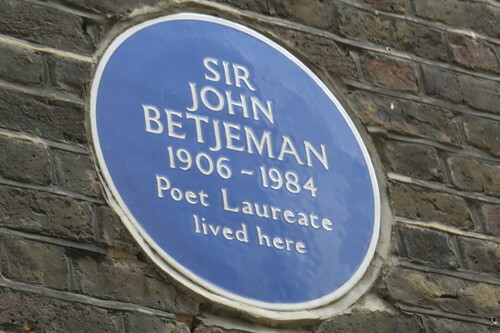 He was Poet Laureate of the United Kingdom from 1972 until his death. He was a founding member of the Victorian Society and a passionate defender of Victorian architecture. He started out as a journalist and ended it as a much-loved figure on British television – not something normally associated with Poets Laureate. The building on the opposite corner (Numbers 41/42) is on fact one of the oldest buildings in the City. 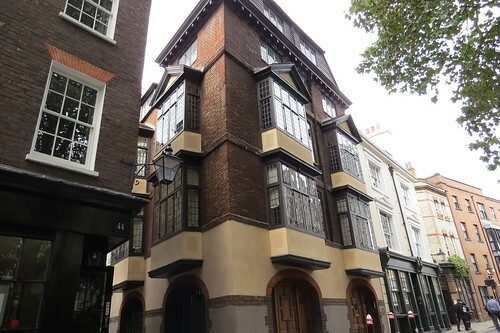 This is a 17th century merchant’s house and was restored in the 1930s. That sadly brings us to the end of our EC1 walk. There is so much more I could have covered but hopefully this has given you a flavour of the area which was shaped by its religious connections, not to mention later commercial activities. It was not just meat and gin – this area had a long history of industry which I have not had time to touch on. 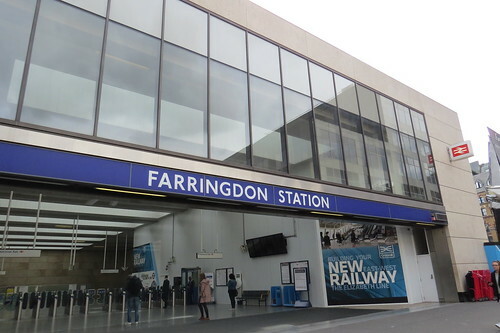 It is a short walk back to Farringdon for onward travel. 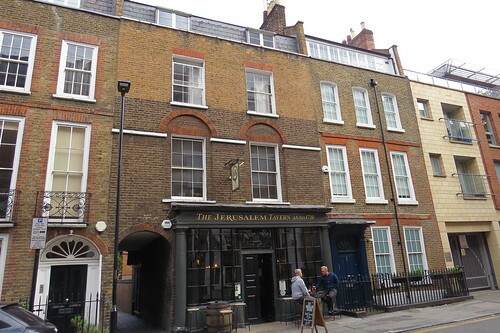 This entry was posted in EC post codes and tagged Clerkenwell, Farringdon, Gin, Jerusalem tavern, London walks, St John's by Stephen. Bookmark the permalink.